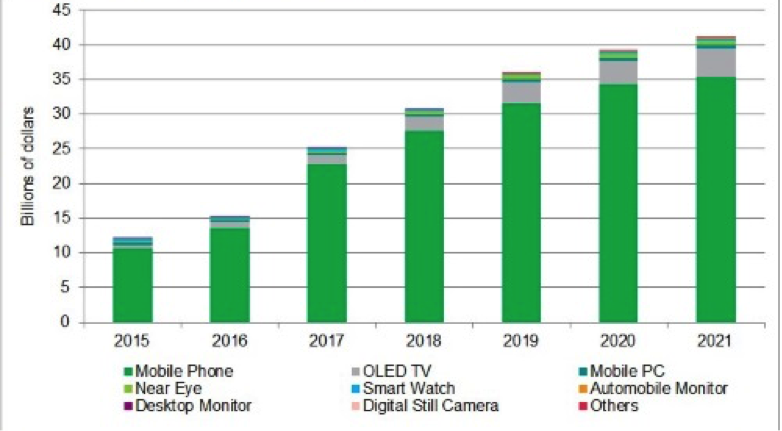 IHS forecasts OLED panel revenue will reach $25.2 billion in 2017, an increase of 63 percent from 2016, due to growing use of AMOLED panels in smartphones and TVs. The OLED panel market will also get a lift from rising demand in head-mounted displays and mobile PCs. Leading smartphone makers have competitively rolled out premium phones this year that boast a narrow bezel or nearly bezel-less designs, the firm noted. The OLED display market is also expected to get a boost from Apple’s decision to use an AMOLED screen in its iPhone series to be released later this year, and Chinese smartphone makers’ moving to newer applications of AMOLED panels, as South Korean and Chinese display makers have been heavily investing in Gen6 OLED fabs in order to increase capacity to meet the surging demand. The OLED TV panel market, the second largest market for OLED displays, is expected to grow to 1.5 million units this year, up from 890,000 units last year, according to IHS display demand forecast tracker. By 2021, the AMOLED panel market is projected to expand at a compound annual growth rate of 22 percent to exceed $40 billion, IHS Markit predicts.